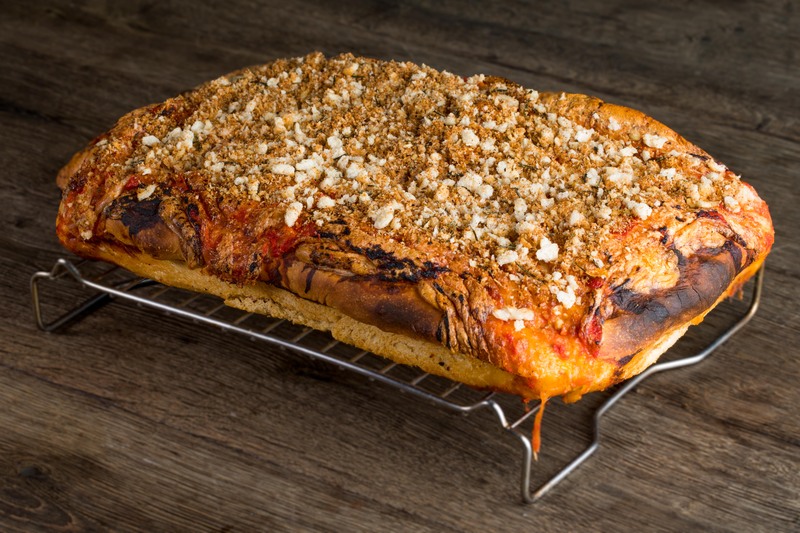 This deep dish Sicilian pizza is a favourite at Stonebake HQ- and a great way to use up any ingredients from a pizza party as well as making the most of the residual heat in the oven! Sfincione uses a lot of oil- it’s essentially fried at the base- that gives a great richness to the pizza. Traditionally it contains anchovies and onions, but this simplified version is a great way to get started with deep dish pizza cooking…..
To make the dough, put the flour and salt into a mixer, dissolve the yeast in the water and add the oil to the water and yeast mix. Gradually add the liquid to the mixer and mix for 8-10 minutes. Pop into a large container, cover with cling film, and leave to prove for an hour to an hour and a half somewhere warm. When the time is up, prepare a 15cm x 10cm tray with a couple of really good lugs of olive oil and knock back the dough before shaping to more or less fill the tray- don’t worry if you don’t quite hit the edges all round. Gently lift the dough and add a little more oil under the dough at this point. Cover loosely with cling film and leave somewhere warm for a further 45 minutes. When the time is up, carefully tear the mozzarella over the top of the Sfincione and dot around the basil leaves. Blend the tomatoes roughly with a good pinch of salt and carefully ladle them over the top of the cheese and basil. Blend the breadcrumbs with the rosemary and garlic and sprinkle over the top of the tomato sauce. Carefully lift the edge of the pizza to double check you have plenty of oil in the base of the pan- it should almost be spilling over the edges!- and pop into the oven for 20-30 minutes depending on the oven temperature. To check it’s cooked, carefully lift the edge of the pizza up ensure they are beautifully crispy and golden. As soon as the pizza is cooked, transfer it to a resting rack and leave for at least 20 minutes before getting stuck in!